Suspected cholera cases have jumped in northeast Nigeria, where Boko Haram violence has forced tens of thousands of people to seek refuge in crowded camps, the Norwegian Refugee Council (NRC) said yesterday. 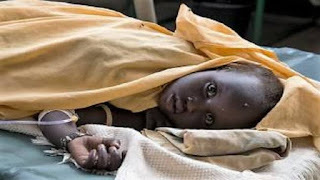 The humanitarian group said over 10,000 people have been affected by the fast-spreading cholera outbreak and 175 have died in the northeast states of Adamawa, Borno, and Yobe as of early November. "One of the major causes of the outbreak is the congestion in camps that makes it difficult to provide adequate water, sanitation, and hygiene services," said Janet Cherono, NRC's program manager in Maiduguri (Borno state). Cherono also blamed the rainy season for worsening the situation, adding, "If more land is not urgently provided for camp decongestion, Nigeria will face another cholera outbreak in 2019." Nigeria has seen regular cholera outbreaks since 2009, when Boko Haram took up arms against the government. More than 1.8 million people have been displaced by the bloody conflict, which has claimed more than 27,000 lives and shattered daily life in the Lake Chad region. If not treated at an early stage, cholera can also lead to death. Nigeria suffers from a high-rate of water-borne diseases as a result of dilapidated infrastructure and under-investment. On Thursday, President Muhammadu Buhari declared a "state of emergency" in the country's water sanitation sector, describing the statistics on open defecation and access to piped water as "disturbing".